Michelle Davies | The Journal Gazette A panel of 10 people addressed the issue of homelessness in Fort Wayne. The panel met at Wunderkammer Co. on Sunday afternoon. The homeless can be chronically ill or mentally ill. Working or unemployed, single or with families or with pets. Temporarily displaced or living under a bridge, on the street, in a hallway or in a stairwell. Wherever they are there, "typically that’s not where they want to be," said Sally Becker Segerson with Street Reach for the Homeless. Years of experience have taught her what the local homeless needs are. 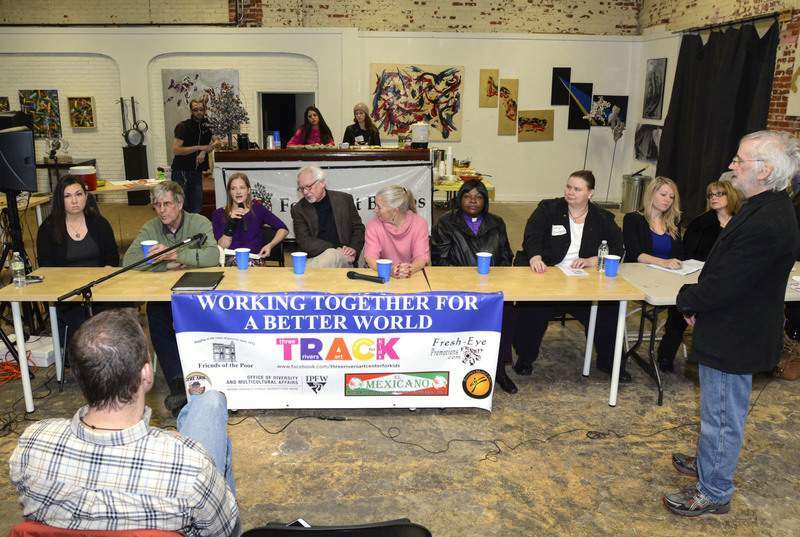 She passed on some of her knowledge Sunday as part of a panel on homelessness held at the Wunderkammer Co., an event and art emporium on Fairfield Avenue. The panel, "Homeless in the City of Churches," was put together by Terry Doran, director for the Theater for Ideas who lined up activists, social workers, media representatives and even martial arts teacher, Steve Basche, who is offering free lessons to the homeless. Geoff Paddock and Glynn Hines, two Democratic City Council members, attended the event as well as Jorge Ortiz, regional director for Sen. Joe Donnelly, D-Ind. All of the City Council was invited, Doran said. Food Not Bombs, a loose coalition of peace activists, came with food that member Liz Turkette said was donated by Fresh Thyme on Coldwater Road. Doran cited an example in Utah where homeless people are given vacant homes to live in. "Utah is on track to eliminate homelessness this year. What have they done? Given homeless people a free place to live, no strings attached. If they can do it, so can we." Doran said. The panelists did not directly address that issue, but talked about who the homeless are and what services are available. Currently 400 to 500 people are considered homeless in Fort Wayne and have some connection to the city’s shelters, said the Rev. Terry Anderson who serves as an adviser for community engagement to Mayor Tom Henry and is a former pastor of First Presbyterian Church in downtown Fort Wayne. But statisticians will tell you that normally 1 percent of a city’s population is homeless which would put the number closer to 2,500 to 3,000, panelists said. "We do a pretty good job in Fort Wayne. Our numbers might be slightly lower than that," said Rachel Rayburn, an assistant professor in the Department of Public Policy at IPFW, who works on the homeless count. It’s a problem that grew in the 1970s, according to Edith Kenna, licensed clinical social worker, pinpointing it to the return of soldiers from the Vietnam War. Now numbers include the working poor who can’t scrape enough together with wage stagnation and rising housing and health care costs. "It’s cheaper to house homeless than to keep them on the street," Kenna said. "Access to a home and health care are a human right," adding that it is part of the "common good." Gina Burgess, a businesswoman and community advocate, said shelters might broaden their requirements, something she came up with after spending 24 hours as a homeless person. As a supposed homeless person, she didn’t fit into any of the categories. Most agreed that homelessness could be addressed by some of the money in the Legacy Fund, money from the sale and lease of the city’s old electric utility that has about $48 million to spend on local projects. "I stay full almost all the time," the Rev. Patti Gimmerson, director of the Victory House on East Jefferson Boulevard, said, even with "cutting on the funds we have to serve" the homeless. Kenna said she was glad to see the young activists from Food Not Bombs behind the panel ready to serve fresh vegetables and food after the panel discussion." Someone has to come along and start making trouble," she joked.